Wolf diet during the summer is highly variable and constantly changing. See it for yourself! This animation shows the diet of a single pack at weekly time intervals from June 24-October 10 (15 weeks) in 2015. This was the first time pack diet has been studied at weekly time intervals during the summer. What this showed was how quickly wolves can respond to new foods. Once berries came available there was a huge change in the diets of the pack. Similarly, we see black bear showing up in the diet in September for a few weeks. This change corresponds with the black bear hunting season in Minnesota. During bear season, wolves start scavenging gut piles of hunter-killed bears because it is an easy, free meal (this is a behavior we have seen consistently since 2015). Yep! The wolves living in Voyageurs National Park in Minnesota eat blueberries – lots of them! Most of the wolf families have been found to spend extended periods of time in July and August, during peak blueberry season, foraging in blueberry patches. Wolf diet during the summer is highly variable and constantly changing. 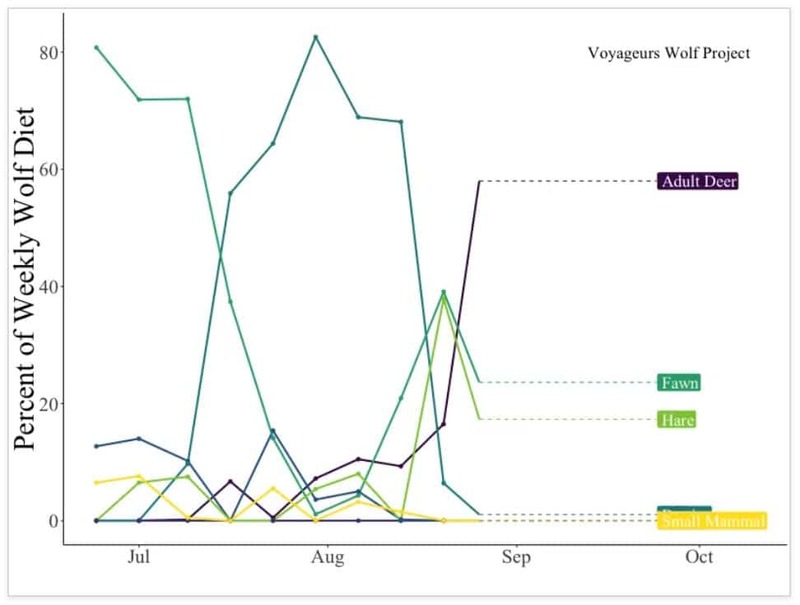 This animation created by the Voyageurs Wolf Project shows the diet of a single pack at weekly time intervals from June 24-October 10 (15 weeks) in 2015. What is the Voyageurs Wolf Project? The Voyageurs Wolf Project is a collaboration between the University of Minnesota and Voyageurs National Park. The project was started in 2015 to study the ecology of wolves and their prey (moose, deer, and beavers) during the summer in the Greater Voyageurs Ecosystem, which comprises Voyageurs National Park, Minnesota and the area southerly adjacent to the park. The ecology of wolves during the summer in southern boreal ecosystems such as the Greater Voyageurs Ecosystem has remained elusive due to the challenges of studying wolves in densely forested habitats during summer. Learn more about the Voyageurs Wolf Project.